Waiting for you to lift and look. Learn to Count, starting with one. Don't give up until you're done!" This adorable book is filled with flaps, 100 of them! Each flap is layered on top of another with many surprises to be discovered. David Carter offers children a magical adventure as they uncover a variety of 100 wonderful things in different scenarios from city landscapes to undersea treasures. This colorful book with amaze your child and teach them to count to 100. My son, Braxton is in Kindergarten. 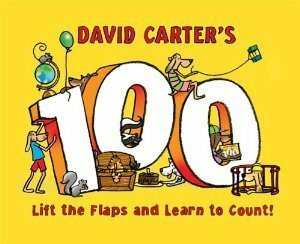 He has been learning to count to 100 lately, and so David Carter's 100 Book for Children is perfect for him. Braxton loves this book. He has so much fun lifting the flaps, looking at the fun and colorful illustrations and achieving his counting goals. He is gaining such confidence in his counting skills. DAVID CARTER is a writer, illustrator, and paper engineer well known for his pop-up and flap books, especially How Many Bugs in a Box? and the critically acclaimed One Red Dot series. He frequently collaborates with his wife, author Noelle Carter, and together they have created a series of Little Mouse books. He lives in Auburn, CA. Learn more at his website, popupbooks.com. Disclaimer: I received a copy of this book to review and to keep. The opinions are my own.